In white chalk on the reverse: "Monsieur Le Comt de Soultrait" There are remnants of two brown paper labels on the reverse, handwritten in ink. Against a bright red background dotted with shimmering stars, the Three Kings pay homage to Christ. The artist depicted Christ as a lively child sitting on his mother's lap, with Joseph sitting behind them. The child dips his hands into the gold coins offered to him, symbolizing his acceptance of his kingship. The figure on the far left is Saint Anthony Abbot, the founder of monasticism. The saint holds a bell to ward off the devil and is accompanied by a pig, symbolizing his healing of infirmity. Pig's lard was one of the remedies for "Saint Anthony's fire," a skin disease named after the saint, which was epidemic at the time. A church or hospital devoted to Anthony as its patron saint probably commissioned the painting. In a gesture of reverence, the oldest Magi, Caspar, kneels before Christ with his crown beside him. The next youngest king, Balthasar, stands behind him. A black page beside the young Melchior refers to the Magi's distant journey from faraway lands. 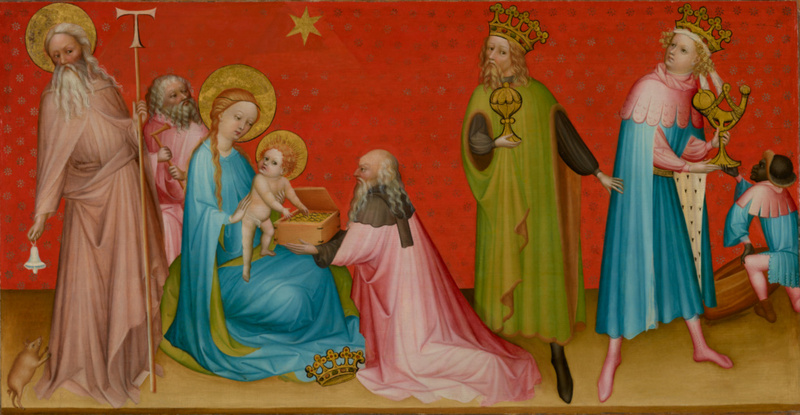 The painting's patterned background and the Magi's courtly, fur-lined robes are characteristic of the International Gothic style that dominated Europe around 1400. The style was characterized by courtly opulence, a degree of naturalism, and an elegant, graphical quality. Private Collection, Besancon, from whom acquired by Jacques-Hyacinthe-Georges-Richard, comte de Soultrait. Source: Rogier de Quireille, La Collection d'Objets d'Art du Comte de Soultrait (Moulins: H. Durond, 1894), pp. 10-11. Rocquigny Family (Château de Balaine, France), sold to a private collector, about 1960/1970. Private Collection (Neuilly, France), placed on consignment with Claude Aguttes (Neuilly-sur-Seine, France). Thomas Agnew & Sons, Ltd. (London, England), sold to the J. Paul Getty Museum, 2004. Quireille, Rogier de. La Collection d'Objets d'Art du Comte de Soultrait (Moulins: H. Durond, 1894), pp. 10-11. Pieper, Paul. "Anbetung der Heiligen Drei Könige mit dem hl. Antonius Abbas: Ein unbekanntes deutsches Tafelbild aus der Zeit um 1400." Pantheon 45 (1987), pp. 54-57, ill.
Brinkmann, Bodo, and Stephan Kemperdick. Deutsche Gemälde im Städel 1300-1500 (Mainz: Verlag Philippp von Zabern, 2002), p. 60, under inv. no. 1792, entry by Bodo Brinkmann. Claude Aguttes, Paris. Tableaux Anciens. Artcurial: Briest, Poulin, Le Fur. December 14, 2002, pp. 22-23, lot 27, ill.
Mund, Hélène, et al. The Mayer van den Bergh Museum, Antwerp (Brussels: Centre d'étude de la peinture du quinzième siècle dans le Pays-Bas méridionaux et la Principauté de Liège, 2003), pp. 233, 250n29. "Calendar." Burlington Magazine 147, no. 1216 (July 2004), pp. 503-4, fig. 88. Agnew's advertisement. Burlington Magazine 147, no. 1226 (May 2005), p. iii, ill. The J. Paul Getty Museum Handbook of the Collections. 7th ed. (Los Angeles: J. Paul Getty Museum, 2007), p. 92, ill.
Doherty, Tiarna, and Anne T. Woollett. Looking at Paintings: A Guide to Technical Terms. Rev. ed. (Los Angeles: J. Paul Getty Museum, 2009), pp. 54-55, ill.
Kemperdick, Stephan, and Friso Lammertse, eds. The Road to Van Eyck, exh. cat. (Rotterdam: Museum Boijmans Van Beuningen, 2012), pp. 168-69, ill.